A few weeks ago some of you may have seen my Instastory overload during my weekend with Dynamis Alliance & Alexo Athletica. If you caught it then you know it was pretty epic. If you didn't well I'm about to tell you all about it and then some. I wasn't planning on recapping the weekend in a blog post but after leaving there feeling so positive, fulfilled, and supported by this group of amazing men & women I feel compelled to share it. It was that awesome! In all honesty, I had no idea what to expect going into the weekend. I knew it would be a mix of firearm and combative training with six other ladies that were also invited but that's basically it. What I soon realized after the morning of the first day is that we all were there to strengthen our personal missions, our mindset, and to improve our self-reliance. If you don't already know, Amy Robbins is the founder of Alexo Athletica which is a fashionable activewear line for the woman that wants to defend herself carrying whatever tool she chooses. Dynamis Alliance is company led by Dom Raso along with his awesome team that sets out to train and equip men and women on many levels to protect and safeguard this country. 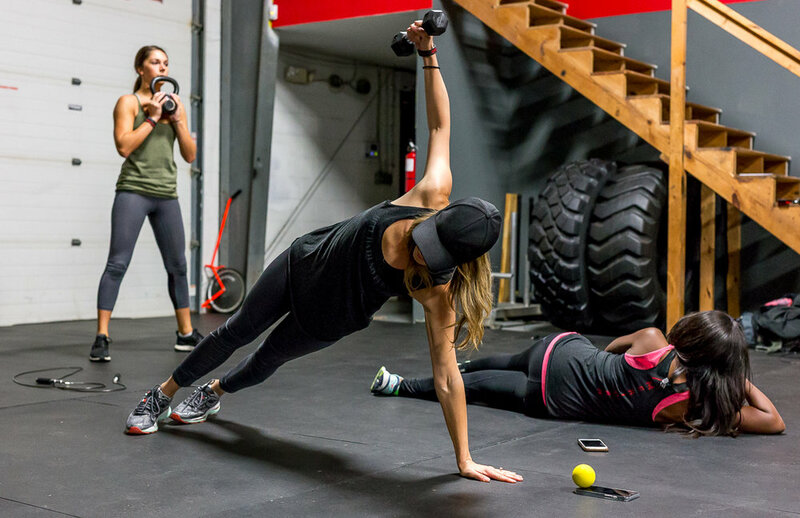 Myself, along with Amy, Antonia Okafor, Reagan Tyler, Corrie, Kait, and Kaya Jones were the seven women signed up to Crush Everything; a Dynamis mantra and mindset that is embedded in all they do. Each day Dom led us in a group prayer along with some motivating & inspiring words followed by a workout. It was a great way to set the tone and mindset for the day ahead. The first day focused on firearm training and one of the best parts was that we all got to sport some Alexo Athletica gear. I had already seen Amy's hardwork first hand but hadn't had a chance to put it to the test so-to-speak so I was definitely excited about that. We spent the morning at Dynamis headquarters with Dom and his team (Dylan and Eli) going over some of the shooting fundamentals such as gun safety, grip, stance, and sight alignment. We dry practiced drawing from concealment and learned techniques when shooting in close proximity of the target. Once we all had a good handle on that we were off to the range to do some live fire shooting. 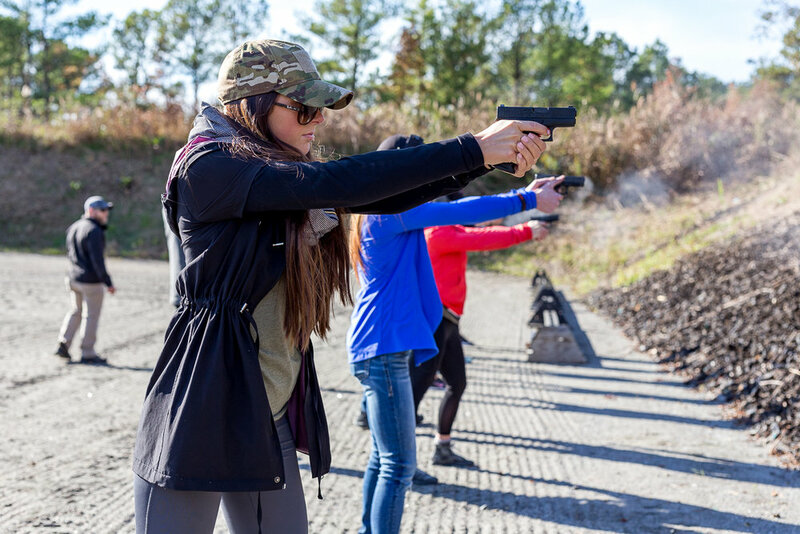 Obviously, the live fire shooting is so much fun but you can't knock dry practice and training because it's such a crucial part of being a responsible gun owner. When we hit the range we took the techniques we learned earlier in the day during our dry practice and applied them to paper targets based on different commands and target points Dylan relayed. I'll admit I was a bit nervous going into the live fire shooting because I know my shooting still needs work. However, all of us were at different levels of shooting and for Kait it was her first time shooting. It was pretty awesome to be able to shoot outdoors as I don't get to do that being in DC. The closest outdoor range is a couple hours drive. For me, one of the greatest parts of the live fire pistol training was getting critiqued by Dom and Eli. I realized that the at-home training that I do really works and it showed. I felt validated knowing that my training at home is paying off but I welcomed the changes I need to make to improve on certain things such as grip and shooting with both eyes open. We wrapped up the pistol training and moved to the carbines where the real fun began. We got to unload our mags onto both paper and steel targets. That was super fun. I've only shot AR style rifles less than a handful of times so getting that extra experience and training in was helpful. I think it's safe to say that we are all hooked on carbines. I'm ready to get one of my own. This was probably the longest span of hours I've spent shooting. I definitely felt the fatigue in my arms when it came to handling the carbines. On day two we crushed an insane workout before getting into the knife training and combatives training. For me, this workout was intense on many levels as I don't work out that hard. I was pushed to my breaking point and, honestly, I wanted to throw in the towel but the encouragement from the team and my workout partner, Kaya got me through it. I didn't give up and more importantly didn't need to use the puke bucket. We all were struggling through different areas of the workouts but we all leaned on our partners to help drive us forward. After crushing the workout and having breakfast we moved on to knife training and combatives training. I've always wanted to learn some knife-fighting skills so this was definitely a treat. We practiced with training knives and walked through some different training scenarios pairing up with each other to practice what we learned. I've never been against having a blade on me for self-defense but this has solidified it for me as a great tool to have on hand especially if carrying a firearm isn't allowed. We moved on from blade training to hand-to-hand combatives - this was fun. We spent a few hours learning different moves from take downs to get ups and from being on the ground to being attacked from behind. After our combatives training we had lunch and what you didn't see on Instagram was the last half of our afternoon; our scenario drills. This was something I was not really prepared for - actually none of us were. Basically, Dom and his team were going to set up two real-life scenarios that each of us ladies would run through. Meaning that part of Dynamis headquarters was transformed into bar and/or outside location and house where we would have to use the skills we learned over the past two days and defend ourselves from attackers. We each took our turns and were told to keep quiet after the scenario as to not let the other women know what was coming. The uncertainty from not knowing what was about to happen made me insanely nervous and anxious. I was really having a hard time mentally waiting for my turn. I was first (lucky me) and as I was led out of our secluded room into the scenario, my nerves stopped. I think I just realized that there was nothing I could do except rely on my skills. That's exactly what I did. The first scenario required me to use my combatives training to escape from a random guy attacking me at a bar. For the second scenario I had to use my combative training and a firearm to ward off my attackers and also save my roommate from someone that was stabbing her. I shot him right between the eyes. Both scenarios were a bit emotionally draining and more so for some of us than others. For some of the women these scenarios were very real as they had experienced something similar in their own lives. What we all came away with was the feeling of empowerment. While there were definite areas that could always use more training, we all got out of the situations and more importantly knew how to handle them. We didn't freeze; our training took over. It was an amazing feeling to know that I'm gaining the skills to handle a threatening situation. I have the skills to be self-reliant. It might sound corny to say that the weekend was life changing but it really was. I get emotional thinking about it and now even writing about it. It's not very often that you find a group of people that you connect with and support what you do, what you believe in, and who you are. Not only do they support it, they are also in their own way striving for the same. We have each others backs and have formed a bond having experienced this weekend together. The weekend opened with everyone in the room (us ladies as well as the Dynamis team) speaking about their purpose and mission. It was moving to listen to everyone open up about their purpose and speak wholeheartedly from within. At the close of the second day, we all took a moment and wrote on the white board about what honor means to each of us. This weekend wasn't just about the physical training it was also about living a life of intention, honor, and respect. It was about coming together as a team, working together, honoring our families, our country, God, and the sacrifices made by our service men & women, motivating us to continue with our missions, and knowing that when the time comes we have the will to fight. It was something that you could see rooted in the foundation of everything that we did that weekend. The passion, drive, and brotherhood from Dom and his team was heartwarming and also inspiring. While my bruises from that weekend have finally faded, my spirit and mission has not. It's stronger than ever. I'm stronger than before. I'm committed to strengthening my weaknesses. I'm committed to continue to train and learn. I'm dedicated to living each day with honor and intention. And I feel even more empowered by my mission of becoming self-reliant and spreading the mission to all of you.